A franchise-record winning streak has given the San Jose Sharks an edge as they pursue a fourth Pacific Division crown. To increase that advantage, they'll need to solve their struggles against last season's champions. The surging Sharks look to pad their lead and beat the Anaheim Ducks for just the second time in 2007-08 when they meet on Friday at the HP Pavilion. 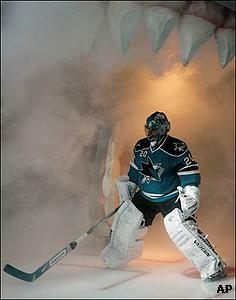 San Jose (44-21-9) last won the division in 2004, and come in having won 13 of 14. That surge has given the Sharks a five-point lead over Anaheim (42-25-8) and eight over third-place Dallas in the Pacific. The Sharks will be looking for their third straight victory since their franchise-record 11-game winning streak ended Sunday with a shootout loss to Edmonton. In a 4-3 win over Minnesota on Wednesday, Jeremy Roenick scored his 507th goal, added an assist and notched the decisive shootout tally to help the Sharks clinch their fourth straight playoff berth and ninth in 10 seasons. "It doesn't matter who gets the credit, but the points are huge," said San Jose's Curtis Brown, who had a goal and an assist in his first game after missing 25 with a hand injury. Evgeni Nabokov was back in net for his 70th start after a rare night off, making 21 saves before stopping two of three shootout attempts to earn his league-leading 42nd victory. The Sharks have the second-best record in the NHL. They also have 97 points, seven behind league-leading Detroit with eight games left and one in hand. "We're just focusing on winning our division and finishing ahead of any team in the East," Sharks coach Ron Wilson said. San Jose's remaining games are all against division foes, including two against the Ducks, who are 5-0-1 in the season series and won 4-3 in overtime on Jan. 13 in the most recent meeting. The Sharks hope to avoid losing four straight to them since going 0-3-2 from Jan. 30-Dec. 10, 2003. San Jose has the league's best road record at 26-8-3, but has also won four of its last five overall at home to improve to 18-13-6 there. Anaheim has dropped three of its last four road games, and six straight in San Jose since a 4-3 victory on Dec. 16, 2006. The defending division winners and Stanley Cup champions, though, opened their three-game road trip with a 2-1 win over the Stars on Wednesday. Todd Bertuzzi scored a power-play goal with 27.2 seconds left for Anaheim, which is 15-3-1 since Feb. 5 and has won four its last five. "These are fun games to play going into the playoffs," Bertuzzi said. "It's a big win for us." Ryan Getzlaf and Teemu Selanne each contributed two assists, while Jean-Sebastien Giguere stopped 20 shots to improve to 12-2-1 with a shutout and a 1.46 goals-against average in his last 15 starts. Giguere has started all six games against the Sharks this season, posting a shutout and a 1.44 GAA in those appearances. Selanne has eight goals and 17 points in 19 games since returning to the Ducks after contemplating retirement. He hasn't faced San Jose this season, but the former Shark has 44 goals and 86 points in 61 all-time meetings.